Jaipur is known for historic sites, museums, childrens museums, shopping, and nightlife. Your plan includes some of its best attractions: explore the historical opulence of Amber Palace, see the sky in a new way at Jantar Mantar - Jaipur, meet the residents at Deer Park, Ashok Vihar, Jaipur, and admire the landmark architecture of Hawa Mahal - Palace of Wind. For reviews, more things to do, photos, and other tourist information, read Jaipur trip planner . Bengaluru to Jaipur is an approximately 3.5-hour flight. You can also drive; or take a bus. Traveling from Bengaluru in November, Jaipur is slightly colder at night with lows of 17°C. Cap off your sightseeing on the 30th (Fri) early enough to travel to Udaipur. Start off your visit on the 1st (Sat): contemplate the waterfront views at Lake Pichola, stop by Gothwal Art, then take an in-depth tour of City Palace of Udaipur, and finally relax and rejuvenate at some of the top local wellness centers. To see reviews, other places to visit, maps, and more tourist information, go to the Udaipur trip maker . You can fly from Jaipur to Udaipur in 1.5 hours. Other options are to drive; or take a bus. In November, daytime highs in Udaipur are 35°C, while nighttime lows are 16°C. Cap off your sightseeing on the 1st (Sat) early enough to go by car to Jodhpur. 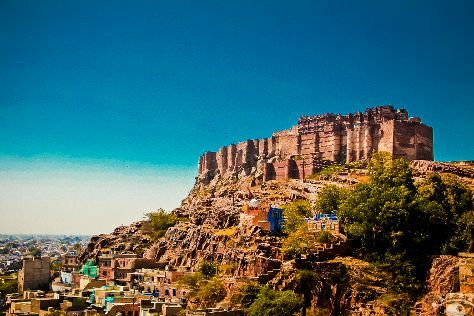 Start off your visit on the 2nd (Sun): soothe aching muscles at some of the top local wellness centers, then contemplate the long history of Mehrangarh Fort, and then whizz through the canopy at some of the top local zipline courses and adventure parks. For ratings, photos, traveler tips, and more tourist information, you can read our Jodhpur trip itinerary builder . You can drive from Udaipur to Jodhpur in 4 hours. Alternatively, you can take a bus. In December in Jodhpur, expect temperatures between 32°C during the day and 12°C at night. Cap off your sightseeing on the 2nd (Sun) early enough to travel back home.